A manual drip coffee machine is the simplest and cheapest home coffee maker you can find. Equipped with only an on-off switch you can’t expect any fancy features. But on the other hand, you get them for already $10-$30. Some of the manual coffee makers include a Pause and Serve function. This feature allows you to remove the carafe during the brewing cycle. But keep in mind that the coffee could taste too strong if only a small amount of coffee has been brewed yet. Don’t take it for granted, that a manual coffee maker turns off automatically after a certain time. Quite often you have to switch the machine off by hand! So make sure your next coffee maker has this feature if it’s important for you. Even when manual drip coffee makers don’t have many features and are cheap, it does not mean that they can’t brew a decent cup of coffee. 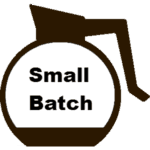 The Mr. Coffee DW﻿﻿13, for example, has been rated as very good in brew performance from one of the known testing labors. It also has great customer reviews at Amazon. Are you wondering, why some coffee makers like Bonavita or Bunn are so expensive but only have an on-off switch as well? Good catch, my dear coffee friend! There are some coffee machines that are indeed only equipped with an on-off switch but cost more than $200. But we’ll look into this further below in the section Best Drip Coffee – What’s The Secret? Automatic drip coffee machines make your coffee making experience more convenient. In most automatic drip coffee makers there’s a display with a clock and timer and a few buttons with some more or less useful features. Standard features are nice to have but tend to be used to over-advertise the coffee machine, when there’s nothing else to promote. If you believed the ads, a cleaning LED is suddenly the most convenient helper you have ever seen. 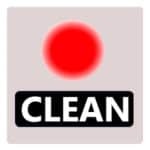 In real, well, it’s still just an indicator light, but you have to clean it yourself. 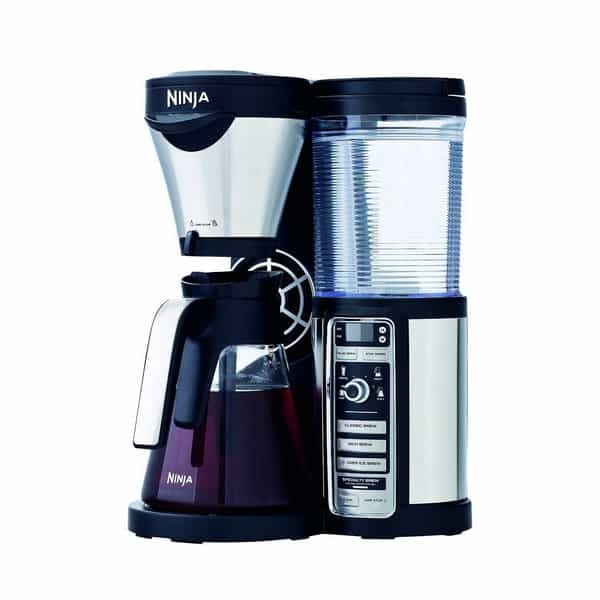 On the other hand, we have premium features which you can only find in the best drip coffee makers. 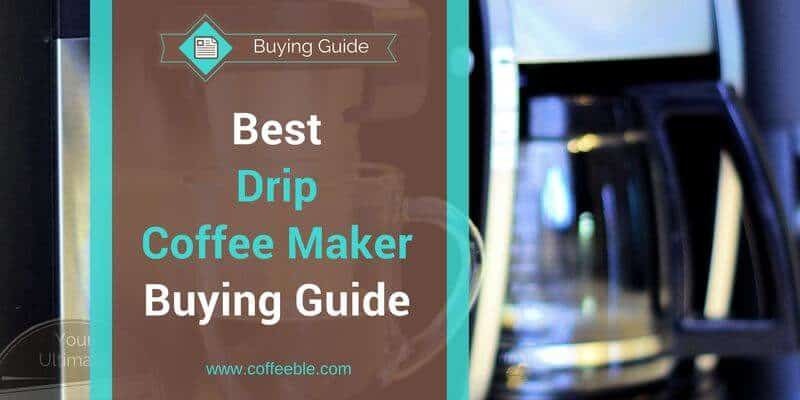 So if you see a drip coffee machine with those features and manufacturers haven’t messed it up, there’s a great chance for you to get the best coffee a drip coffee maker can brew. Make yourself a picture further below of available standard and premium features and then choose yourself which ones are important for you! Coffee tastes best when brewed with freshly ground coffee beans. If you don’t want to go the extra mile with a separate grinder this feature is a great option. The price typically depends on two factors: the type of grinder (burr or blade) – and the material of the carafe – stainless steel or glass. A disadvantage is definitely the cleaning of those machines. There are some tight spots that are hard to clean, especially the funnel between grinder and basket. so this might be a reason to pass. Just make sure you know what you get yourself into or if a normal drip coffee maker and a separate, easier to clean coffee grinder is a better option for you. The standard cup size of drip coffee makers is in most cases 4, 8 or 12 Cups. One cup of coffee is almost always considered to be 5 ounces. In other words, a 12 Cup Coffee Maker would serve you approximately 60 ounces of coffee. I’m not sure how small your cups are but mine can hold up to 8 ounces. So in my case, I could only serve 7 ½ cups with a 12 Cup Coffee Maker. Just to keep the possible misunderstanding of cups vs ounces in mind. There are also on-demand coffee makers available. 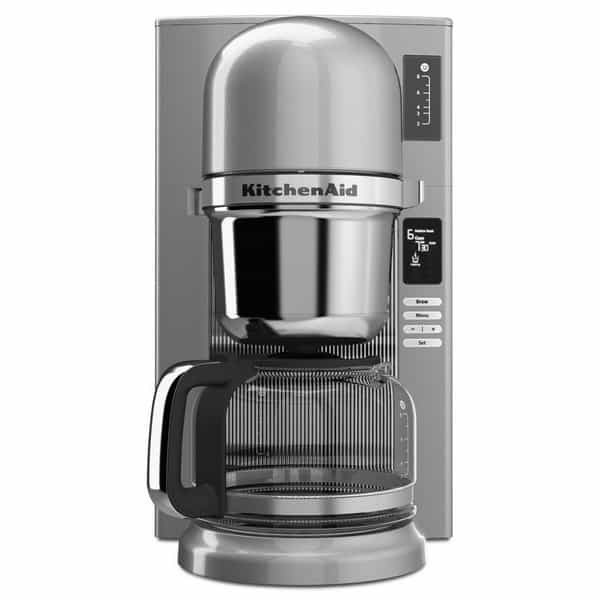 Instead of having a glass carafe for the finished brew, the coffee stays inside the coffee maker until you need it. Coffee is dispensed right into your cup by pushing a button, similar to a water dispenser in refrigerators. These also called Brew N Go Coffee Maker (Black N Decker) orBrewstations (Hamilton Beach) are available in different cup sizes as well. Programmable coffee makers have an integrated clock to let you set a timer to start the coffee brewing process. This is especially helpful in the morning when you get ready for work and are in a rush. Some of the fancier programmable coffee machines have a button to select the brew strength, like bold and weak. Basically, the coffee maker slows down the water flow to increase the contact time of coffee to water, which gives you a slightly stronger cup of coffee. If you tend to forget the regular chore of cleaning, you may like the self-cleaning feature in some automatic drip coffee makers. There’s no magic in this feature, though. Either there is an indicator light that reminds you to clean it or you add hot water and vinegar and a cleaning solution and press the self-clean button – which I don’t know what differentiates it from starting a regular brew cycle. Drip coffee makers are programmed to have a perfect timing of the water flow for a full carafe to provide you with the best-balanced coffee flavor. To guarantee you the same taste for only 1-4 cups, the coffee machine must release the water slower which you can achieve with the Small Batch feature. If you often are in a rush to get out of the house and forget to turn off the coffee maker, this feature comes in handy. Some coffee machines automatically turn off after a preset time while usually the more expensive ones let you choose a time yourself. This filter usually filters out the chlorine in the water which helps to improve the overall quality of the water flavor. If you have a water filtration system in your house, this filter is not necessary. Be warned – now we’re going in-depth about coffee brewing features. We may even be a little finicky about the coffee we drink with the best drip coffee maker. With this saying, if you want one of those high-end coffee makers with premium features, there’s no way around to also buy specialty coffee. Brewing stale coffee from the grocery store with a high-end coffee maker is wasted money. The perfect water temperature (195°F – 205°F), as will be described below, is one of the most important factors to brew a perfect cup of coffee. 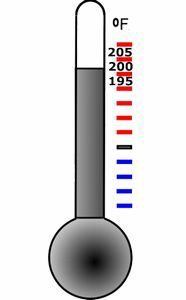 Keeping the temperature in this range is only one thing and even some cheap coffee makers are pretty good at it. But being able to change the temperature ensures a greater flexibility in the coffee brewing process and helps you to find your preferred coffee flavor. You should know that lighter roast coffees are supposed to taste better at higher temperatures around 205°F while darker roasts do best about 5-10° lower. So as you can see different roasts of coffees, higher and lower temperatures, and the combination of both can have a significant impact in the final coffee tasting experience. Freshly roasted coffee releases CO² gases for several days. When you manually brew coffee and pour hot water over the grinds you’ll most likely see them rising and small gas bubbles appear. To get all gasses out, you’ll just add some water and then wait for at least 30 seconds. This procedure is called pre-soak or pre-infusion. The rise of the grinds and the bubbles is called “the bloom”. Read more about the coffee bloom at Foodal. There are not many automatic drip coffee makers that simulate pre-infusion. So if you plan to use freshly roasted specialty coffee for your best drip coffee maker, I would highly recommend the pre-infusion feature. Check my table above to quickly find out, which coffee maker offers the pre-infusion feature. 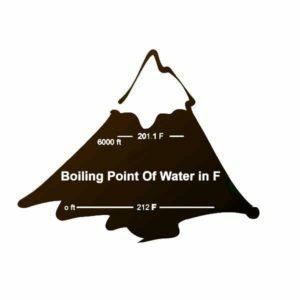 The boiling point of water at 0 ft altitudes is 212° F. The higher above sea level you live, the lower the boiling point of water is and vice versa. 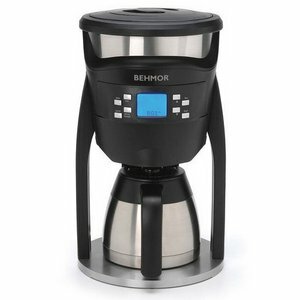 Some drip coffee makers can be adjusted so the coffee maker still heats up to the perfect coffee brewing temperature. Pour Over is a form of manual coffee brewing which results in one of the best tasting coffee. A few newer drip coffee makers mimic the pour over brewing method to combine perfection and convenience. If you want to read more about the pour over brewing method, check my page about the best coffee makers. Have you been wondering why your friend’s or neighbor’s coffee tastes so much better than yours at home? You both have a drip coffee maker! You even borrowed some of your friends coffee beans to make sure they’re not some sort of magic beans. But no, the beans don’t make a difference. So you’re coffee maker must be broken, right? Well, not necessarily. Evеrу drір соffее mаkеr brеwѕ іn a similar mаnnеr, hеаtіng wаtеr іn a rеѕеrvоіr аnd allowing іt tо drір thrоugh a fіltеr of ground соffее. But to brew a perfect cup of coffee, the drip coffee maker must conform to certain requirements. The Specialty Coffee Association of America (SCAA), the probably smartest guys in the US when it comes to coffee, have guidelines to bring the coffee brewing process to perfection. The SCAA also tests drip coffee makers and certifies them if they meet their rigorous requirements. Let’s have a look at the key factors which determine if a coffee maker succeeds or fails to brew a great cup of coffee. You should know, the recommended temperature for drip coffee makers to reach within the first minute is between 195° F and 205° F.
A good coffee maker should also keep this temperature during the complete brewing cycle. Most of the times, the temperature is too low and as a result, your coffee tastes weak and sour. So if you want the best drip coffee machine, make sure to check my reviews and whether it’s brewing at the correct temperature or not! As a result, some coffee grinds are less extracted than others. And less extraction means, less flavor, or in other words, a boring cup of coffee. The shower head should be able to evenly wet all coffee grounds inside the brew basket. 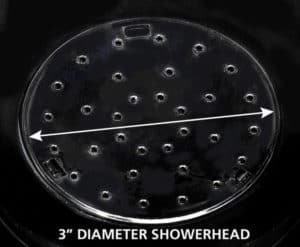 But poorly designed shower heads tend to neglect the grounds on the outside areas. You see, the problem is, you cannot really watch it since the shower head is in the coffee maker. After the brewing cycle has finished, open the brew basket and look inside. Take a spoon and check the grounds if there are any dry or unevenly wet spots. Yeah, I know it may look odd when somebody comes in the kitchen seeing you digging in the coffee grounds. So think about a good excuse prior to being caught. Another sign could be when you need an extensive amount of coffee to get a strong enough Java in your cup. 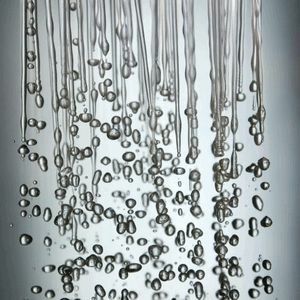 While this could have several reasons, one of them could also be, that the shower head inside your coffee maker simply does not perform well enough and a lot of coffee is barely touched by the water. When coffee makers are not certified by the SCAA, that does not necessarily mean they have failed these tests. You should know, that manufacturers must pay a fee and send their coffee machine to the SCAA before they get tested. So if you can’t find anything about this certification, the manufacturers probably haven’t sent their product to the SCAA. It may be hard for you to figure out yourself if a non-certified coffee maker would pass these tests. Therefore, I have done all the research for you to save you time! Whenever trustworthy information is available I have included it in the table above. Just find the Brew Performance – a rating better than 4 stars means, the coffee maker has or would probably pass the tests. Would you keep your coffee in a pot on your stove on low heat to keep it hot? Probably not. But if you have a glass carafe in your coffee maker, you do exactly that. So most coffee makers with a glass carafe fail to keep coffee hot AND delicious over a longer time. Don’t get me wrong, a glass carafe is totally fine, as long as you drink your coffee fast, share it with the family or colleagues, or refill it into an insulated thermal carafe. But using the heating plate of your coffee maker over a longer time can give your coffee an unpleasant burnt aftertaste. Try to brew only in small batches or pour your coffee into a thermal carafe after brewing. Coffee best practices include always drinking #coffee while it's fresh. Keep it hot through insulation only - not reheating! Over the last years, I have had several drip coffee makers. I started with a cheap one for 20 bucks before I purchased one with a thermal carafe. I also had a drip coffee maker with blade grinder and burr grinder. So I’m convinced I can give you an honest and truthful recommendation about what drip coffee maker is best for you. We all look at customer reviews to get a better understanding of the reliability and popularity of a coffee maker. I compared several drip coffee maker ratings at online stores like Amazon, Wal-Mart or Target, just to mention a few. As you can see, this is exceptionally not my own opinion but that of thousands of others. 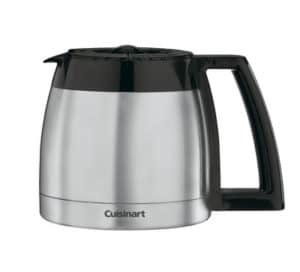 Still, I would not recommend the Cuisinart PerfecTemp® DCC-3200 to you if I was not to purchase this drip coffee machine myself. The OXO On Coffee Maker is, in my opinion, the easiest one to use while at the same time guarantees you a great cup of coffee every time! There’s only one dial button with wich you select the number of cups you are about to brew – 2 to 4 or 5 to 9. Let the OXO coffee maker do the rest: heat water to perfect brewing temperature and mimic the pour-over brewing method. And the intuitive LED display keeps you updated with the current brewing status. You can read more about all the hidden features in my OXO On 9-Cup Coffee Maker Review. It was an easy decision for me to choose the Brazen Plus as the best programmable Drip Coffee Maker. Temperature control, pre-soak adjustment, or temperature adjustment for different altitudes are just a few of the programmable features that make this coffee machine so great. And best of all, this drip coffee maker is certified by the SCAA. Read my full Brazen Coffee Maker Review to get all details about this certification and what else this coffee maker has to offer. The Mr. Coffee DW12 is the best cheap coffee maker because according to a well-known test labor it brews coffee very close to the recommended brewing temperature. 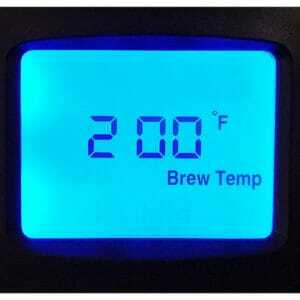 And brewing temperature is the most important factor why many coffee makers fail to brew good coffee. It also looks like that consumers confirm the test results because almost 80% gave the coffee maker at least a 4-star rating! So if you are on a budget and need a cheap but still good coffee maker, consider the Mr. Coffee DW12 or DW13 (black). One thing is for sure with an on demand coffee maker: you don’t have to worry about a replacement carafe anymore in case it breaks. 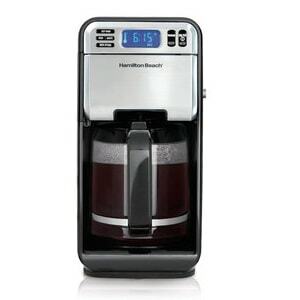 The Hamilton Beach 48464 Brewstation offers some nice features like brew timer, auto-shutoff or small batch brewing (1-4 cups). It can brew up to 12 cups of coffee and since you don’t have a carafe to see how much coffee is left, there’s a small window in the basket. 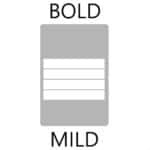 There’s also a button for you to change the brew strength from regular to bold. One thing that might let you hesitate to buy this great coffee maker is the fact, that hot coffee is in contact with plastic all the time while sitting in the tank. However, all parts that come into contact with the coffee are confirmed to be BPA-free. To be honest, this was the hardest decision. 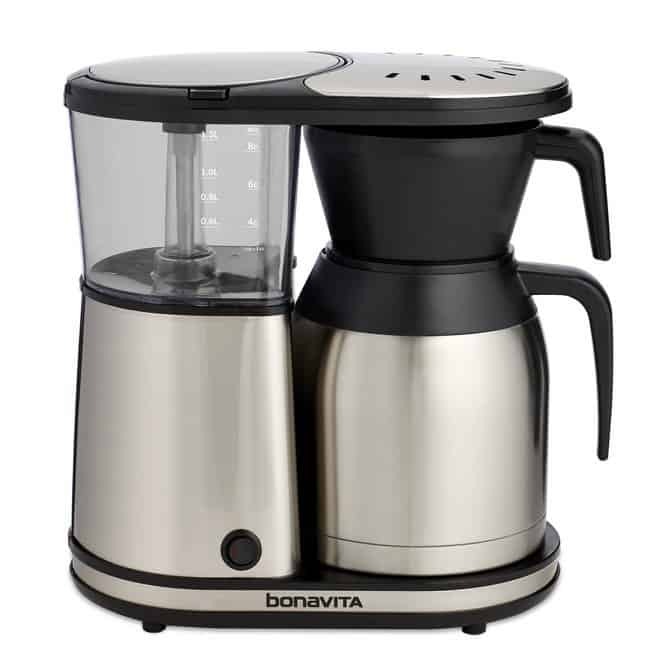 Don’t get me wrong, the Bonavita BV1900TS is one of the best coffee makers with thermal carafe, no doubt about it. And having a coffee maker with a stainless steel carafe is such a nice thing to have. But it looks like, all coffee makers with insulated carafes have one problem in common. You can’t get the coffee pot completely empty without turning it entirely upside down, which results in spilling all over the place. The Bonavita BV1900TS of all drip coffee makers with thermal carafe appears to have the least issues with a spilling carafe. 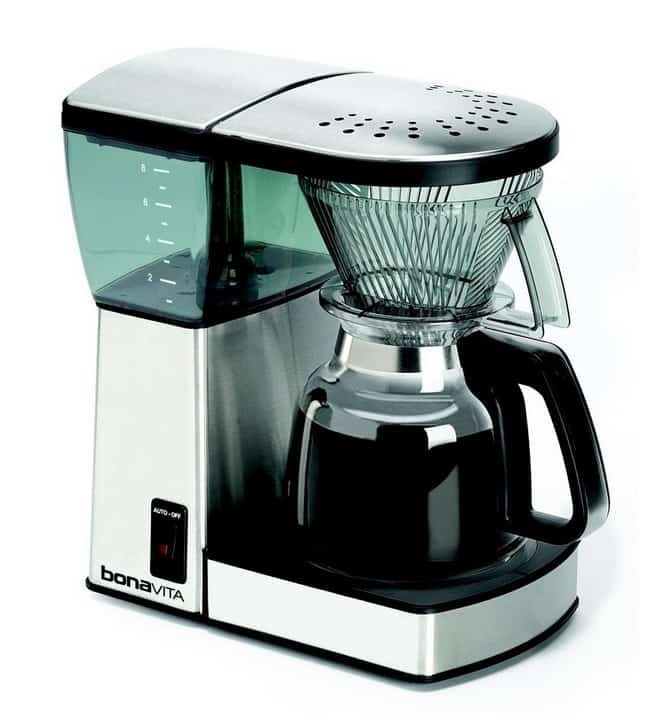 In case you want to know more about this coffee maker, read my Bonavita BV1900TS review here. The Bunn MyCafe MCU is a coffee maker for any type of coffee you want to brew. It does K-Cups, coffee pods, and hot water. But my favorite feature is the single cup drawer for ground coffee. So strictly speaking it’s not really a drip coffee maker. But if you’re looking for a single cup coffee maker that brews with ground coffee, the Bunn MyCafe MCU coffee maker would be my first choice. 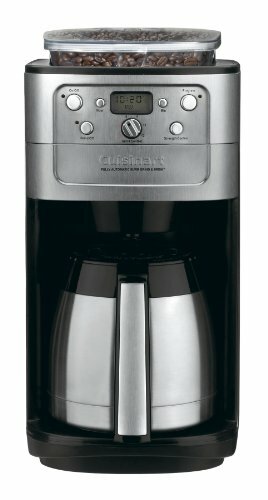 The Cuisinart DCC-450BK has a few nice features, which you won’t find very often in small coffee makers. This 4-cup drip coffee maker shuts off automatically after 30 minutes so you don’t have to worry about leaving the house without turning it off. And the other great feature is the stainless steel thermal carafe! Imagine, you work in a home office or just want to brew one batch of coffee that should last a few hours. Oh, have I mentioned that the Cuisinart DCC-450 is also available in red and pink? Well, check it out! The Hamilton Beach 40515 42 Cup Aluminum Coffee Urn is the perfect companion for parties, business meetings or larger families. It takes about 20 minutes to get the water to boil and another 20 minutes to brew a full urn. 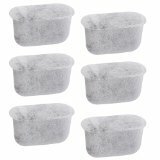 You can also use it to brew tea, make hot cocoa or apple cider, or just boil water with it. But this could alter the taste of coffee afterward if you are planning to use it for more than one hot beverage. As with other drip coffee makers, one cup is considered to be around 5 ounces so 42 cups are actually about 210 ounces of coffee. Dual drip coffee makers are not available in masses anymore so you should not be too choosy with what features you would like to see. There is no timer or brew strength regulation setting. There’s also no auto-shut off feature, just a simple switch! The Kitchen Selective Double Brew Station can brew up to 12-cups of coffee per pot and has two individual heating elements (good if you only want to brew one pot but don’t want both carafes to be heated). 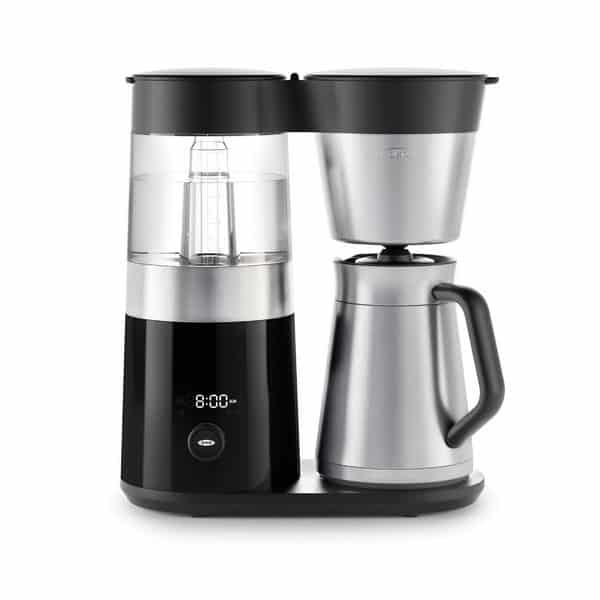 So if you’re looking for a basic drip coffee maker, with which you can brew, for example, regular coffee and decaf coffee at the same time, this coffee maker should please you.